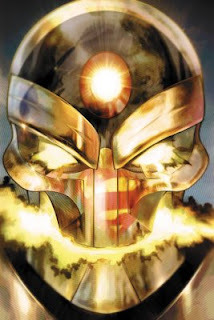 This is the cover to issue 39 of Supergirl, featuring Reactron. I wasn't sure how to go about rendering all of the metal, and wound up experimenting quite a bit. I started with a quick digital sketch as a foundation (which I used to get approval for the image from my editor) and made a new line drawing by tracing the rough sketch cleanly. I then shaded the line drawing by hand with some water-soluble graphite pencils, which I was able to blend with a clean wet brush. I also went in with some white paint to pull out some highlights. I scanned the gray "chrome" rendering back into the computer, placed it over my basic sketch, and tried several different blending modes to marry it with the base layer. It required quite a bit of brushing and smudging to look decent. After a lot of playing around, I somehow arrived at this. I'm not sure if I pulled off exactly what I had in mind originally, and the metal is more convincing in some areas than others, but that's how it goes. As soon as I finished this one, I went straight to work on another Supergirl cover, which I will post this weekend.